Sitting in the shelter is a young male springer, only three years old. I look at the outside of his cage and a sign says "Not good on meet and greet." This note has placed the springer on death row. He only has a few days to live and I am his only hope. He wags his tail at me and I hear myself saying, "OK, let’s take him out and see what he’s like." 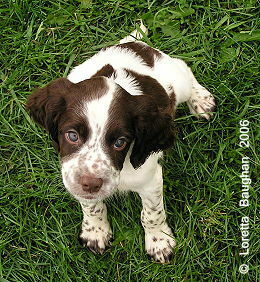 My heart is beating because I know that if I take home an aggressive springer, there will be no adoption for him. We meet in the play yard and I wait to see what will happen. Slowly the boy runs up to me, kisses my hand and runs away. "OK," I hear myself say, "I will take him." Why did this beautiful dog end up in the shelter on death row? In another state, a handsome young field-bred springer was tearfully surrendered by his owners because they just couldn't give him the time or attention that he needed. "Why?" is the question I most often am asked when I tell people about rescue. Why would springer spaniels end up in a shelter, or needing rescue?... Why? It is not an easy question to answer. Some of you will think that only poorly bred dogs end up in rescue. Others might think that only old dogs or aggressive dogs end up in rescue. Still others will be sure that no dog they bred would ever end up in rescue. Patch was an owner relinquish that was obtained for a friend who didn't want a black and white dog. Bullet was given up by his owner when his new wife did not think he matched the new landscaping. True! "Still others will be sure that no dog they bred would ever end up in rescue." Having worked as a rescue member for nine years now, I still find my self wondering how 1,279 Springers needed assistance from English Springer Rescue America in 2006. English Springer Rescue America, Inc. (ESRA) is a national referral and foster care, purebred placement organization, and a 501(c)(3) nonprofit corporation. ESRA's mission is to provide foster care and adoption referral services to humane societies, private shelters, and animal control facilities nationwide that have English springers impounded. Adoption referral assistance is also available to those owners who can no longer care for their springers and must give them up for adoption. Rescue is the hardest work I have ever done. Seeing springer spaniels, whose sole purpose in life is unconditional love, ending up in this condition makes my rescue work the hardest labor of love... and the most fulfilling work of my life. "How can you do it?" That is the second-most often question I am asked. "How can you work with a dog and get it ready for adoption then give it away?" "It’s never easy" is the answer. Most times, I cry as the dog leaves my life and moves into his wonderful new home. The tears are of joy, mixed with the sad knowledge that another dog will need me all too soon. Now I hope your next question will be, "What can I do to help?" Help your local rescue volunteer by transporting a springer, fostering a springer, or grooming a foster dog. Or, you can sponsor a Special Needs dog, either one-time or with a monthly donation. Finally, leave a legacy to rescue. You can remember springer rescue in your final arrangements. Yes, there’s a need for your help. We need your help - but more importantly, the dogs need it. If you want to assist a springer in need, see our website, springerrescue.org for details. Get involved! It’s a labor of Love!